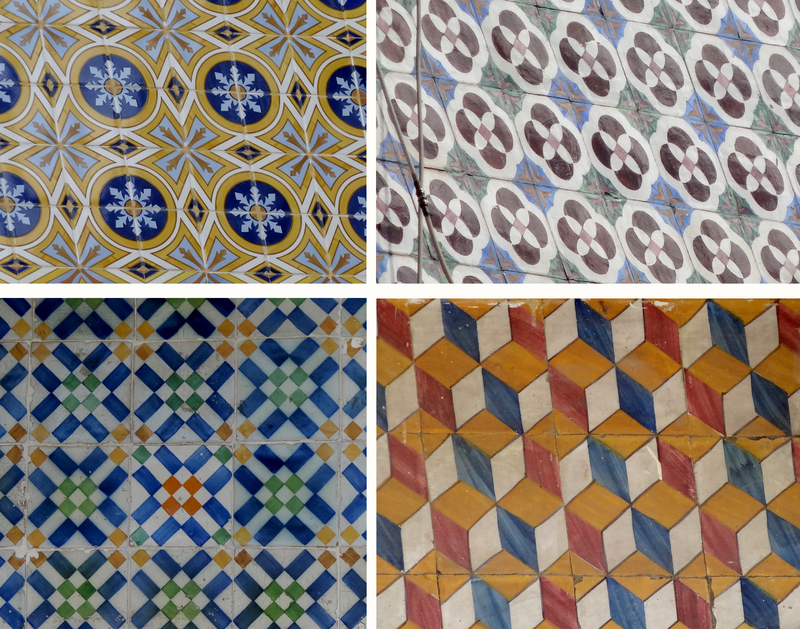 Last week I was on holiday in Portugal and photographed tiles. 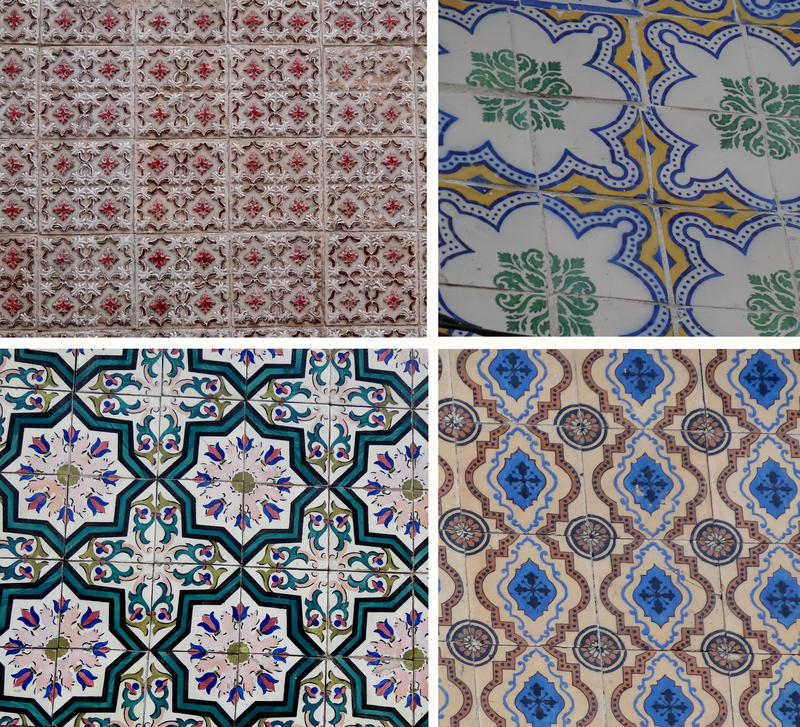 Many Portuguese houses are decorated with tiles. Sometimes they cover the whole building, but more often it is just the lower floor or the upper floors or just one band across the building. I thought it was brilliant. My boyfriend started to go a little crazy because I wanted to take a picture of almost every tile we came across, but hey, can you blame me? Just look at them! I think they’re very inspirational and I can see some of these turning into a quilt block or two. 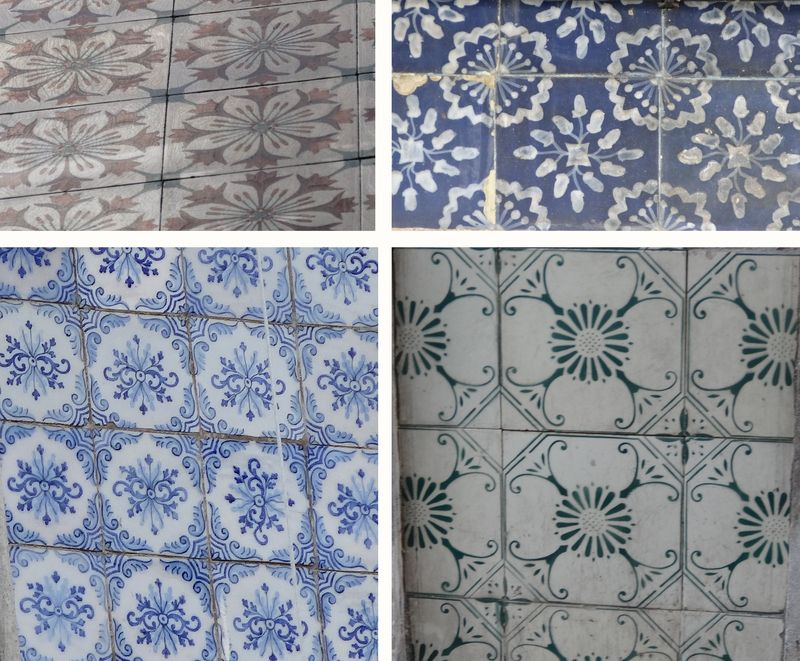 I just love the variety in these tiles. Some are multi-coloured, some have borders. Some have a very simple design, others have a design that only really works when you put multiple tiles together to create the pattern. They can be well maintained, faded or cracked. Most are only painted but sometimes you come across one that has texture. Some of you might be wondering whether I bought any fabrics during our holiday and I didn’t because 1) We tried to travel light and buying yards of fabric didn’t really fit in with that, 2) I sort of already have a lot of fabric that maybe I should use first and 3) I was on holiday with my boyfriend so I thought it would be nicer to do things that both of us enjoy doing, which sadly excludes fabric shopping. I did spot some fabric and yarn stores though, so for those of you planning to visit Portugal in the future that do want to spend some time fabric or yarn shopping I can give you some advice! Tecidos means fabrics, so stores selling fabric will usually display this word on the outside. Lisbon: While waiting downstairs of the Elevador de Santa Justa (simply brilliant, it is a public transport elevator from 1902!) I spotted a fabric store across the street on the left side. Another fabric store is located on the left side in the street that the 373 (to Castelo) and 714 (to Outurela) busses leave Praca da Figueira from (I tried to find the street name on the map but I am not sure which one it is). We did enter this fabric store but I thought it didn’t have very interesting fabrics so we left quickly. A bit more down this road there is also a yarn store. Coimbra: There is a yarn store in the R. Joaquim Antonio de Aguiar. When you come from the Largo Da Sé Velha it will be located on your left side. Viseu: Simply walk down the R. Dr. Luis Ferreira and you’ll encounter at least 3 stores selling fabric (two of these also sell other things but they clearly had fabric displayed in their windows) and 1 store selling yarn. 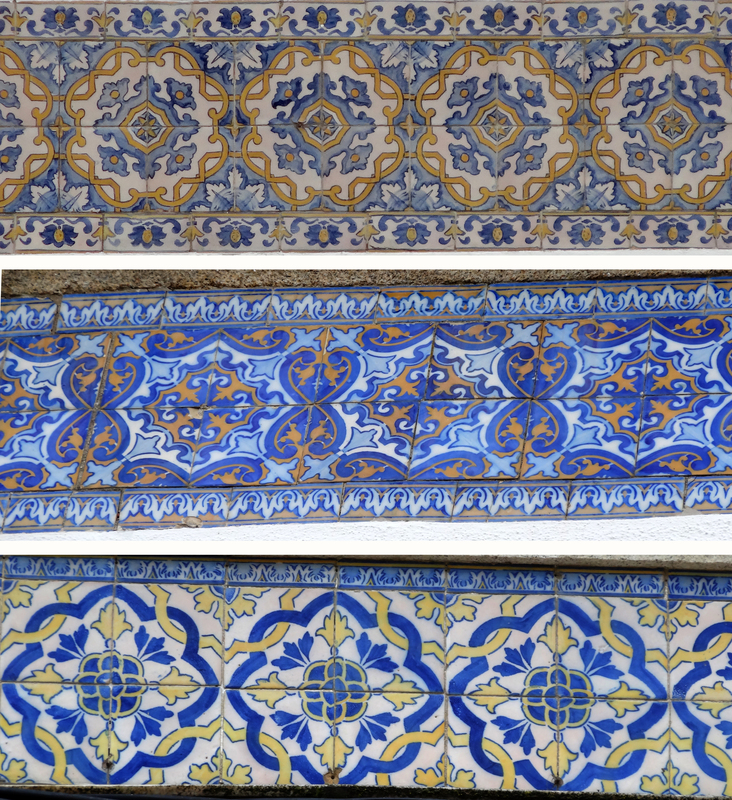 And I’ll leave you with some more tiles to ogle. These are probably my favourites. I found them in the Monastery of Santa Clara-a-Velho in Coimbra. They are at least several centuries old. 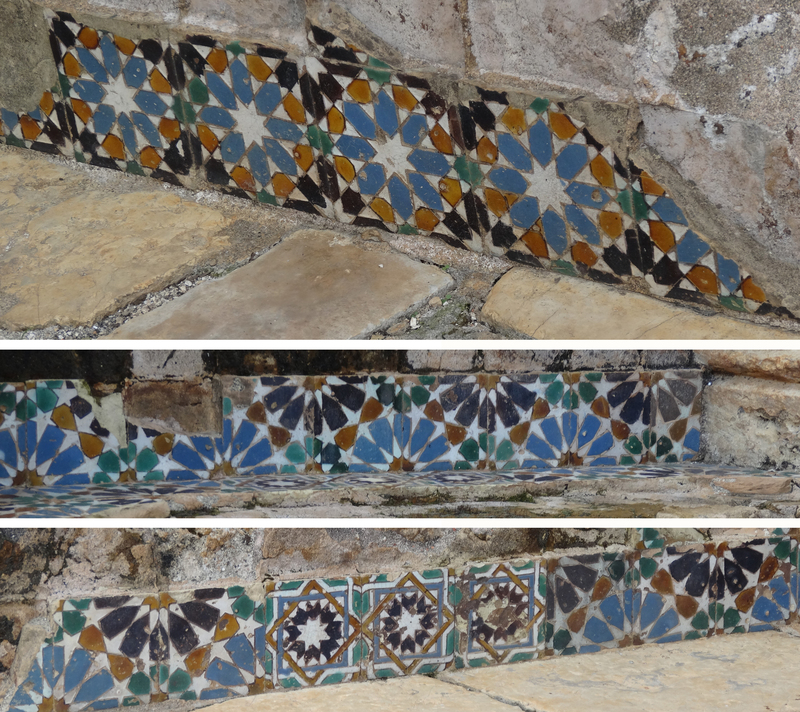 In the early sixteen hundreds the part of the monastery where these tiles are located flooded every year. They even built another floor in the church and turned one of the upper story windows into a new door so they could continue using the church for a couple more decades until they build a new monastery a bit higher up a hill. Considering all that, I think these tiles are still in pretty good shape! Right… How did I fail to notice this while I was constructing it??? I can assure you, that was not good for my motivation… I finally unpicked it yesterday and made a new cuff today. Of course, that didn’t even take all that long so I should really learn to just fix these things immediately instead of waiting until the right mood hits me. 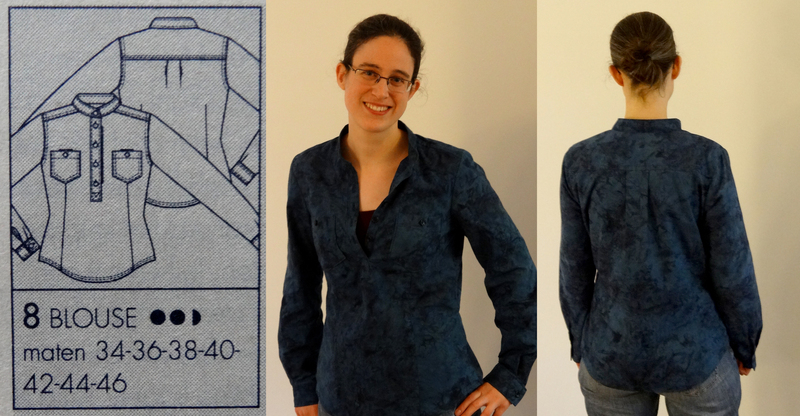 The pattern is blouse 8 from Knipmode October 2011. I am pretty sure I started this top in the winter of 2012. This was in my pre-muslin days and as a result I find that it doesn’t fit as well as it should. For example, I could have done with some more room across my chest. I let out the side seams a little bit, but since I used 1 cm seam allowances I didn’t have a lot to play with. With all the buttons open it is wearable and I’ll probably wear it at least a couple of times. Don’t think it will become my favourite top though. Is it just me, or does anyone else get the feeling they’re being watched? Because I think it is quite funny I am showing you the judgement error that also stalled the sewing process for a while. I wanted to use buttons from my stash and thought some very light pinkish ones would work well. You guess right, they didn’t. 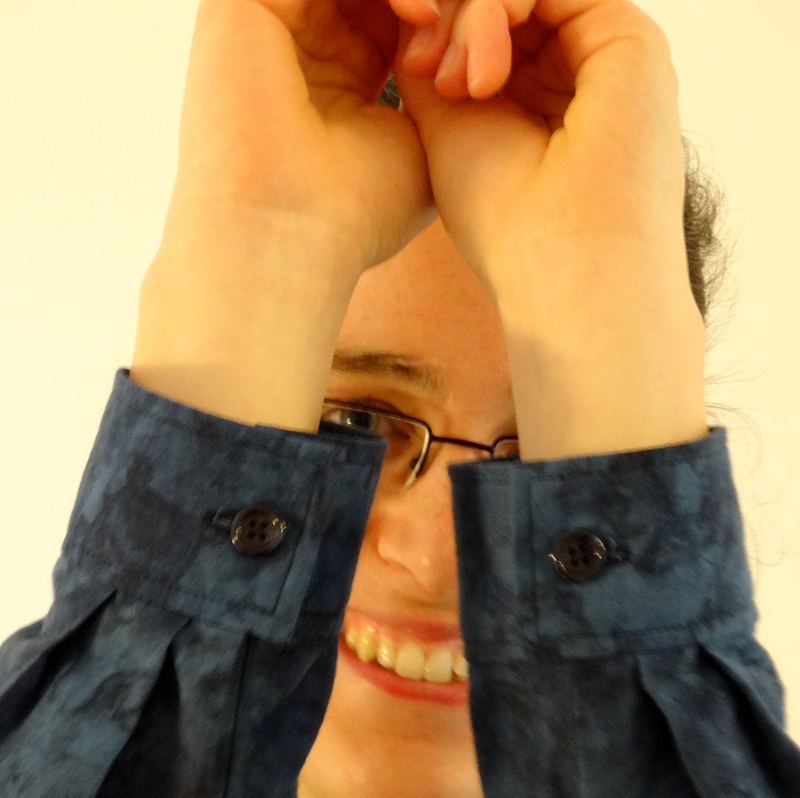 Just take a look at what it happened when I attached the pocket buttons. Uh uh, very wrong indeed… Unfortunately I had already made all the button holes and cut them open so not only did I have to find new buttons I also needed to find ones that were more or less the same size as the original ones. I was lucky to find something suitable in the second shop I went to. Anyway, I managed to bust another UFO and it feels really good to have gotten rid of yet another plastic bag in my sewing room. 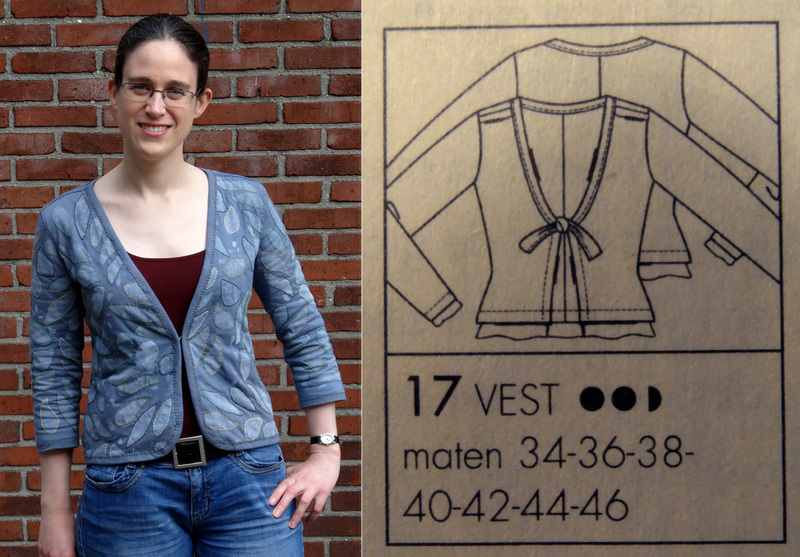 Do you often have to change your plans for a garment half-way through like I had to with this top? Fabric postcards are ideal projects to work on when you get that crafty urge and want to make (and finish!) something but don’t have a lot of time or don’t want to work on the project you’re already working on. They don’t require a lot of material and you can make them as simple or as complicated as you want. One of the things I love about making fabric postcards is that you can incorporate almost any technique into your project. If I feel like doing some hand embroidery, great, I‘ll get out my embroidery needle and thread. Some random applique with left-over scraps? Why not? 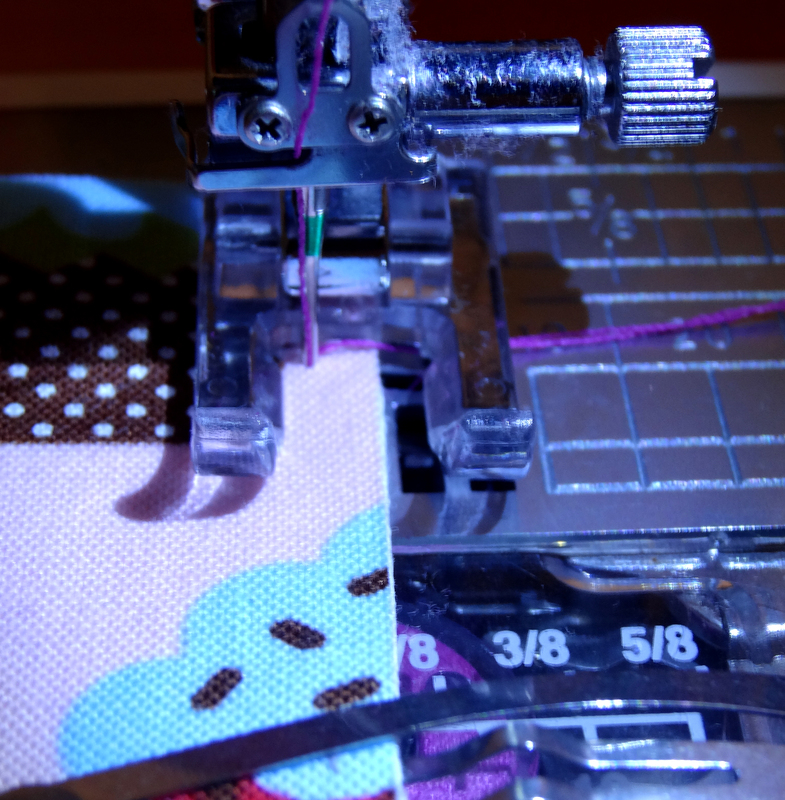 Or try out some of the embroidery stitches on my machine? Just let your creative juices flow and enjoy the moment of creating something. And, the big bonus, you’ll end up with something that you can use. 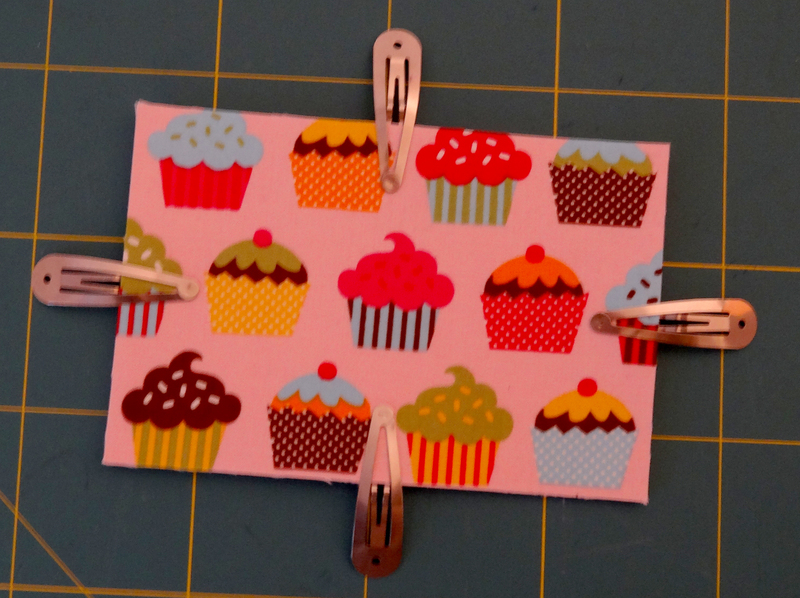 In this tutorial I am showing you my method for making fabric postcards. Firm iron on interfacing such as Vilene/Vlieseline s520 or Pellon’s Peltex #71F (I’ve also seen it being called Vilene ultra firm fusible and Decofix). You really want to use this very firm/stiff interfacing because it gives the finished postcard a real postcard look and feel. Another option that I think might work is Decovil-1, but I’ve not yet been able to test this. 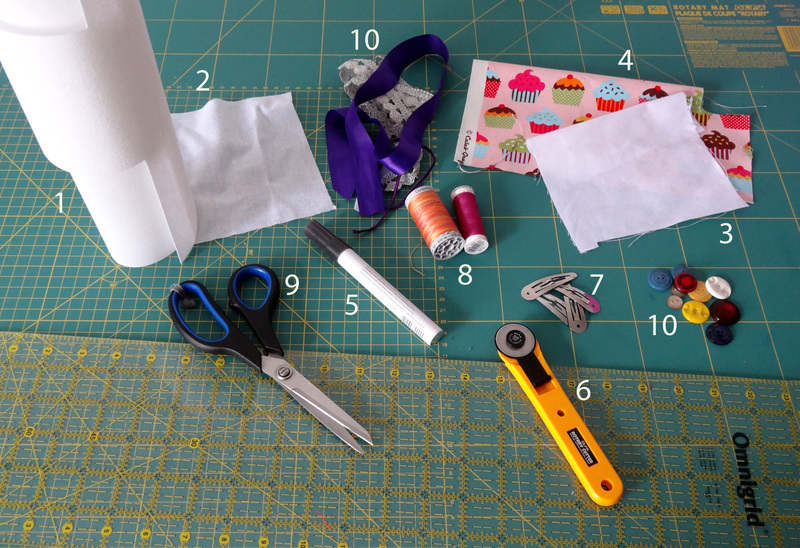 Optional: fabric scraps, buttons, ribbons, trims, beads, embroidery thread etc. 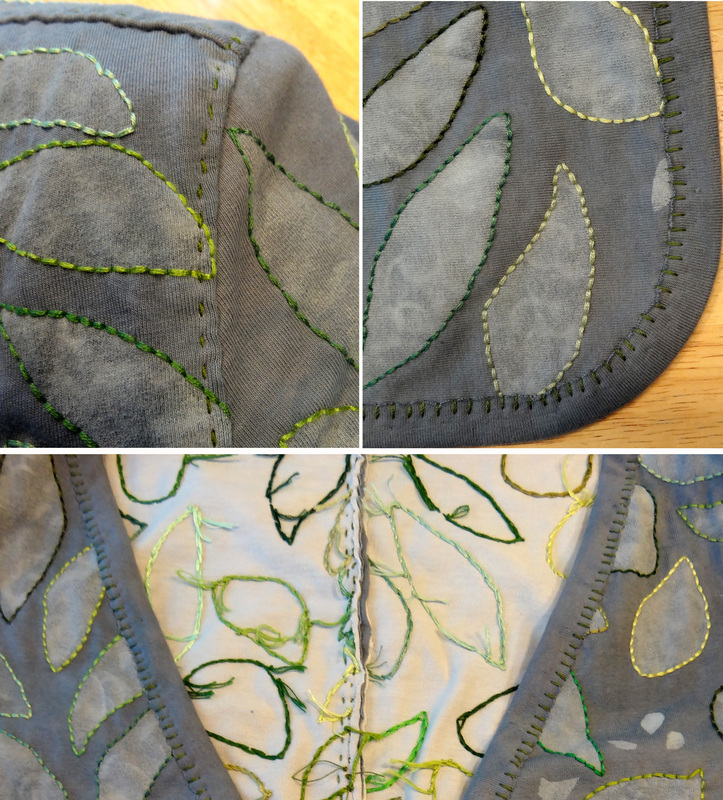 The first thing you want to do is to reinforce the fabric for the front with the fusible interfacing. I prefer to use a medium weight woven interfacing. 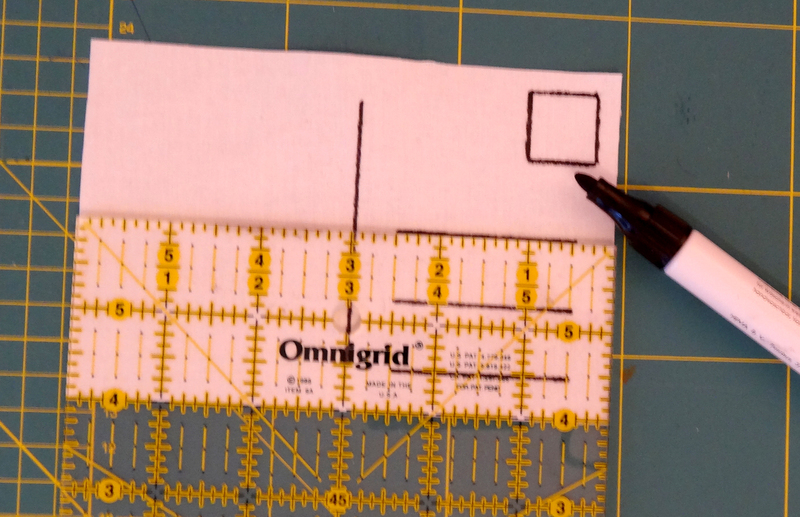 Cut your background fabric and fusible interfacing a little bit larger than the finished size of the postcard. I cut mine 6.5’’x4.5’’. Use your iron and some steam to fuse the interfacing to the fabric. Cut the firm iron on interfacing and the white cotton fabric for the back a little bit larger than the finished size of the postcard. Again I cut mine 6.5’’x4.5’’. Use your iron and a little steam to fuse the interfacing to the white cotton. Step 4: Cut postcard to size. Place your postcard front and back on top of each other, wrong sides together. Use the cutting mat, ruler and rotary cutter to cut the postcard to size. By cutting the front and back of the postcard at the same time you ensure that they will fit perfectly during the assembly step. 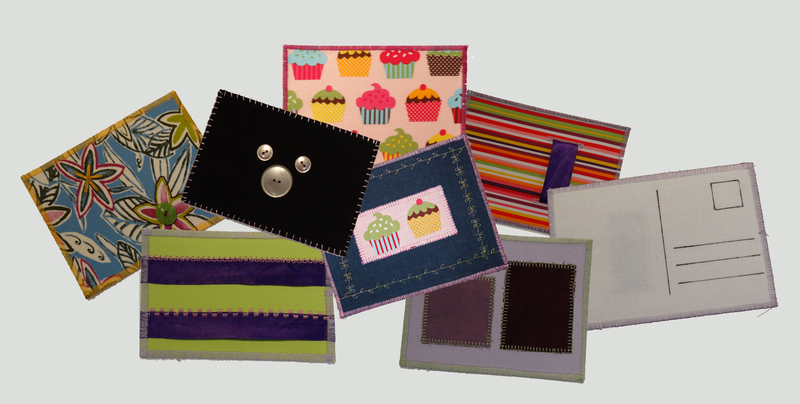 Use buttons, ribbons, trims, decorative stitches, embroidery floss, applique etc. This is where you can be as creative as you want. In the picture at the top of the page you can see some examples of postcards I’ve made to get some ideas. One thing you’ll want to keep in mind is that you will use a zigzag stitch to assemble the front and back pieces so you don’t want to place buttons or other bulky things too close to the edges. Use the ruler and waterproof marker to draw the distinctive postcard markings on the back. Alternatively, you could also “draw” these lines with a stitch line, but I prefer to draw the lines with a marker. If you added a lot of bulky things like buttons, now would also be a great moment to write your message on the back of the postcard because the bulk on the front will make it significantly more difficult to do this once the postcard has been assembled. Leave enough of a margin though because the edges will be covered in a zigzag stitch! Place your postcard front and back on top of each other, wrong sides together and use the clips to hold the two pieces in place (seriously, this works much better than pins because the interfacing is so stiff). I used a Schmetz quilting needle size 90/14 and an open toe embroidery foot. I usually use a walking foot, but I realize not everyone has one for their machine. Sew a zigzag stitch around the fabric edges to attach the front to the back. I used a stitch width of 5 and a stitch length of 0.5. You can of course play with the stitch length and width. It is important that the edge of the fabric becomes encased in the zigzag stitch. With each swing to the right the needle should end outside of the fabric. When you reach a corner, stop with the needle down just outside of the postcard (see picture below). Lift the pressure foot and, while keeping the postcard very close to the needle (this is important, you don’t want to pull out a whole lot of thread), turn it 90 degrees. Put the pressure foot down and continue sewing. Repeat when you reach the next edge. Stop sewing when you reach your starting point and secure. Keep in mind that a very large postcard or one with lots of extra’s such as buttons will be heavier; make sure that you put enough postage on your postcard before sending it off! So far, all of my fabric postcards have reached their destination within the Netherlands. I have never sent one of these cards abroad so I can’t say anything about foreign postal services, you’ll just have to give it a try. Dutch stamps are stickers and they adhere very well to the cotton fabric that I use for my postcard backs, if the stamps in your country don’t, you might have to use some (fabric) glue to make sure they don’t come off. I hope I have inspired you to give making fabric postcards a try and I would love to see the postcards that you made using this tutorial! 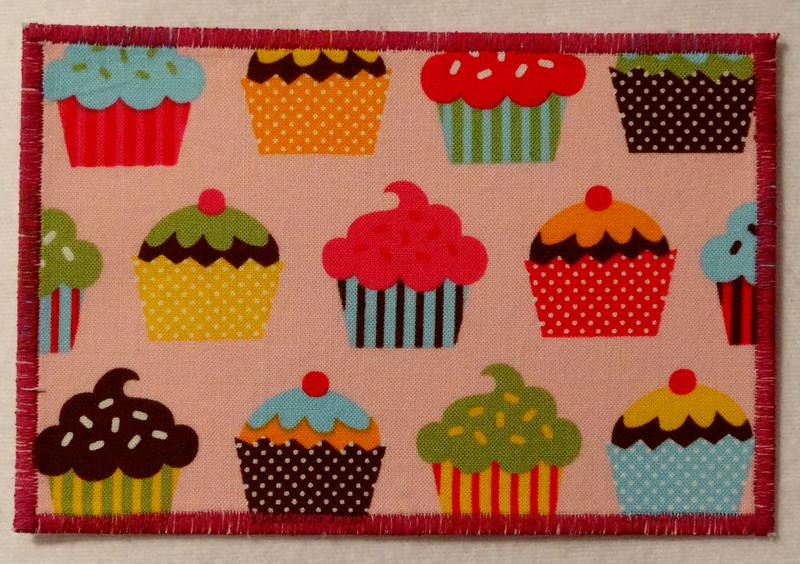 In a future tutorial I will show you how to make quilted postcards. I am in love with this cardigan, it is absolutely perfect in all of its imperfections. It is also completely out of my comfort zone. 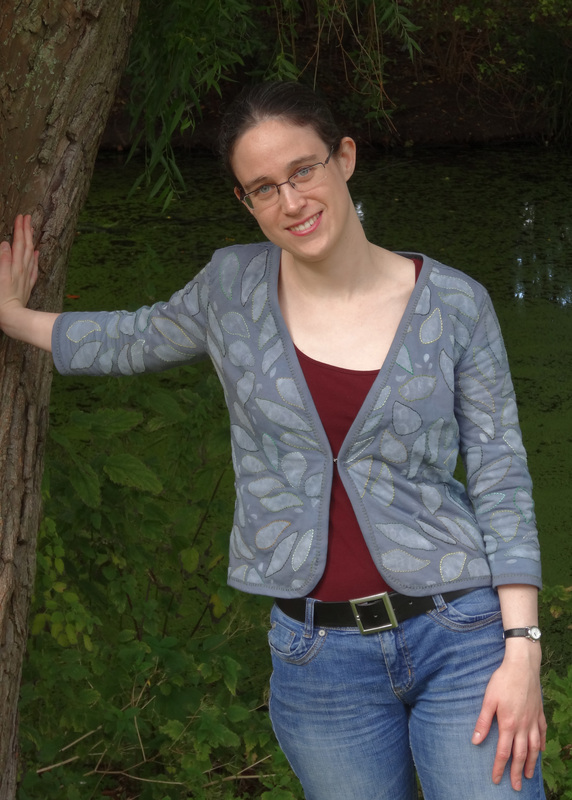 Who would have thought that I was going to wear an embroidered cardigan and love it? Not me, that’s for sure. I am a no-nonsense girl, my wardrobe consists for more than 90% of solids and typically lacks frilly details. So, how did I end-up creating an all-over embroidered garment? It all started when Craftsy launched their Hand Embellishing Knit Fabric course that is taught by Natalie Chanin from Alabama Chanin. 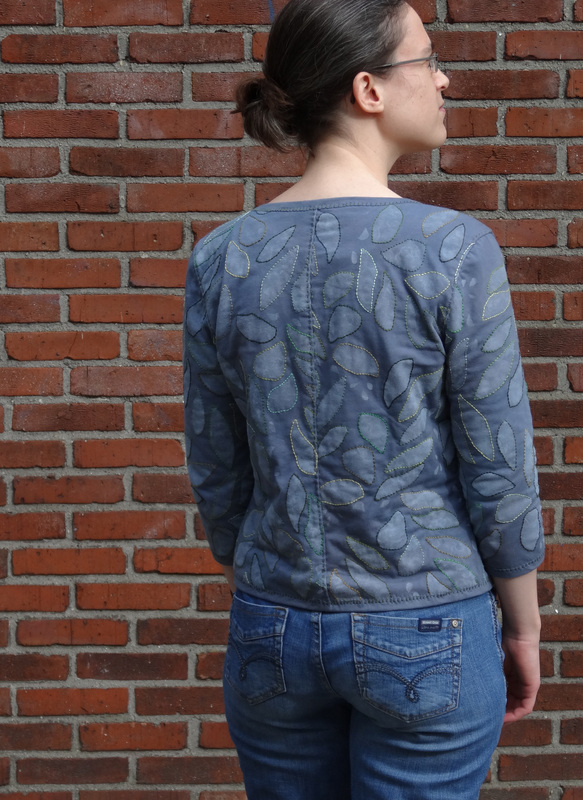 Alabama Chanin sells completely hand-made embellished garments made from 100% organic cotton jersey. Their garments are very expensive, which is totally understandable once you realize how much work is put into creating each item. For those of us that cannot afford to spend several thousand dollars on a single piece of clothing they sell books and supplies that help you to create them yourself. I became fascinated by this process so I signed up for the Craftsy course and also bought the Alabama Stitch book. Would the woman who made this pattern still recognize it? 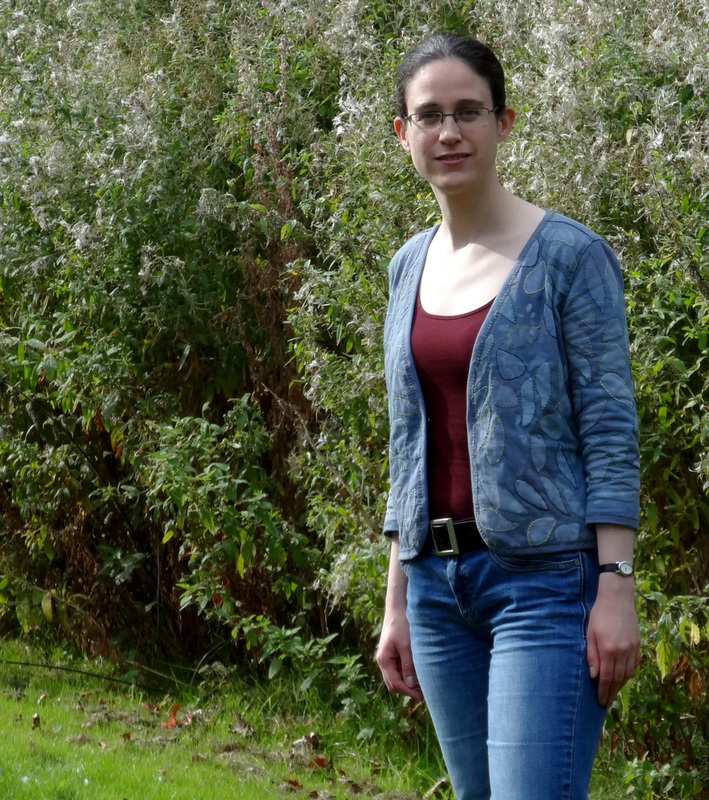 I decided against using the coat pattern supplied with the Craftsy class (it’s huge and I don’t think I’d wear it) but instead made cardigan 17 from Knipmode June 2011, that I already made once before. I did make some adaptations though. The original pattern calls for some voile being sewn in at the hems and shoulder seams, I had already discarded this detail as too frilly in my previous version and left it out here as well. I added 1 inch to both sides at centre front tapering to nothing at the shoulder. I shortened the sleeve to ¾ length because I couldn’t fit a full sleeve out of my fabric, and I usually push up my sleeves anyway. I also rounded up some corners to make it easier to install the ribbing around the edges. For the closure I used a hook and eye instead of ties. Alabama Chanin garments typically consist of two layers of cotton jersey. For embellished versions a stencil is used to paint shapes onto the fabric. This is then embroidered, (reverse) appliqued and/or beaded. I used 2m white 100% organic cotton jersey and dyed it with procion MX 128 warm black that turned out more grey blue than black, but I love it anyway. The inside layer is a lighter shade than the outside layer because I used a more diluted dye bath for that piece of fabric. The stencilling was done with white paint and the bloomers stencil supplied with the Alabama Stitch book. For the backstitch embroidery around the painted shapes I decided to use all the different shades of green I had in my stash which is probably close to 30 different colours. I love the effect that this creates. It also made the embroidery part more fun because I could make some design choices along the way. The ribbing was attached with the whipstitch. I’m sure some of you are wondering how long it took me to complete this project. I keep a sewing logbook in which I write down what I do each day to help me keep track. I started this cardigan on March 16 of this year and worked on it during 46 days. On some days I only embroidered one shape, but I think it is safe to assume that on average I probably worked at least 2-3 hours a day, so in total it took at least 100-150 hours to complete it, but that might still be a conservative estimate. Anyway, I don’t really care how much time it took, all I know is that I ended up with one pretty amazing and unique garment that is for sure going to be a wardrobe staple! I am definitely going to continue on this handsewing journey. It was a very relaxing process, I kept the project in our living room and worked on it while watching television or listening to music. It was also really nice that I could take this project with me to work on it elsewhere because it didn’t require a sewing machine. Talking about comfort zones, I now also want to try my hand at beading, yes beading. I just had to add this picture because my boyfriend, who took the pictures, thought it was very funny, so this one is for him! Don’t unpick and accept sloppy seams as your sewing signature. Over time I’ve learned to unpick quickly and selectively and this helps to make unpicking less of a chore. I’ve found that the fastest way to unpick a seam is to rip every 5th or so stitch on one side of the seam (don’t count, you want to do this quickly, if it is the 4th or the 6th stitch you’ll also be fine!). In the places where you backstitched you’ll want to unpick more stitches. After you’ve done this for the entire seam, you can then turn to the other side of the seam and place your seam ripper under the thread. You should be able to pull out the whole thread on this side of the seam in one go. All that is left now is to remove the smaller pieces of thread on the side you unpicked first and you are ready to redo the seam. If I’ve sewn a seam and there is just a tiny little pucker somewhere while the rest of the seam is absolutely perfect I am not going to unpick the whole seam. I’ll only do a couple of centimetres around the pucker so that I can smooth that area out and resew it. I’ll backstitch and partially overlap the original seam. I used to feel that this was a bit like cheating, but I’ve seen several Craftsy instructors use this technique as well so I refuse to feel guilty about it. Selective unpicking will save you a lot of time and a lot of frustration. Do you have any other tips that make unpicking more enjoyable?